One could argue that the history of the Société des Auxiliaires des Missions (SAM), truly began when a schoolboy named Frédéric Lebbe (1877-1940) decided to become a missionary in China after reading about Jean-Gabriel Perboyre who died a martyr at Wuchang 武昌 in 1840. At the age of eighteen, Lebbe entered the seminary of the Congregation of the Mission, founded by St. Vincent de Paul, at St. Lazare in Paris, and identified himself as Vincent Lebbe to signify his resolution to emulate both St. Vincent de Paul and St. Jean-Gabriel Perboyre, the Vincentian missionary he admired so much. By February 1901 he was on his way to China, where he was assigned to the Apostolic Vicariate of Beijing under Bishop Alphonse Favier, another Vincentian, who ordained him a priest in October of that same year. Unlike most other Catholic missionaries in China at that time, Father Vincent Lebbe was less interested in Western nationalism than in promoting a truly indigenous Chinese Church. His support of this ideal created tensions between himself and some of the Catholic hierarchy in China, and he was sent back to Europe in 1920, where he remained until 1927, when he was finally allowed to return to China. During his exile in Europe, Father Lebbe, in 1922, met Father André Boland of Verviers in Belgium, and shared with him his idea of training European priests to serve, at the first opportunity, under Chinese bishops. This became a reality in October 1926, and while Father Lebbe was heading back to China with one of the recently ordained Chinese bishops, Father Boland began gathering a group of young men, the beginning of what will be soon known as SAM or, in Chinese, the Lei Mingyuan Society雷鳴遠會, named after the Chinese name of Father Lebbe. SAM is neither a religious order nor congregation, but rather a society of secular priests. Once sent to serve a native bishop, the Samist is entirely under the Chinese bishop’s jurisdiction as a new member of the diocesan clergy. In 1930, Raymond de Jaegher was the first Samist to leave for China where he joined Father Lebbe to serve under Bishop Sun Dezhen 孫德禎 in the Vicariate Apostolic of Anguo. Under the inspiration of Father Lebbe and his abiding love for China, the Samists went to serve the Chinese Church when the country was constantly torn by war: the Civil War of 1927 to 1950 between the Communists and the Nationalists, and the war against Japanese invasion from 1937 to 1945. They were among the most active missionaries to carefully preserve their experiences in print and photographs. For the most part, the photographs, images and written documents found in the archives of Catholic orders and congregations that came to China from Europe and the Americas during these years tend to emphasize missionary accomplishments in ecclesiastical territories entrusted to non-Chinese bishops. By contrast, the photographs and archival documents held at the SAM archive provide an eyewitness and grassroots visual account of the beginning and growth of the first Chinese-led local churches. This rich collection is an historical treasure for a more complete understanding of the Church in China during the first part of the twentieth century, as well as its survival after the Communist takeover of China in 1949. 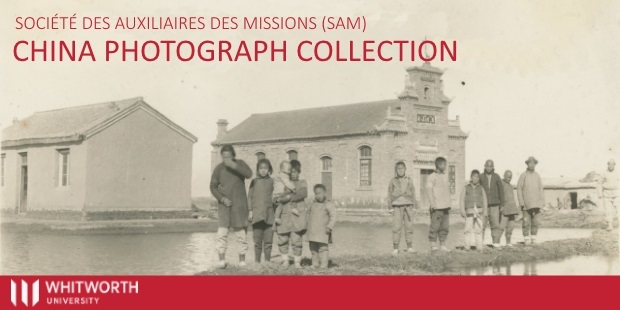 All the photographs and images included in this SAM China Mission Photograph Collection were obtained from the main SAM archive kept at the Centre SAM in Brussels. The collection is composed of two main categories of images: 1) a set of twenty-six photo albums belonging to Samists who worked in China between 1926 and 1952; and 2) twenty-six “Boxes” containing loose photographs and religious images, many of which are not in the albums, and were retrieved from the personal files of individual Samists. The six-member team who digitized the SAM China Mission Photograph Collection was directed by Dr. Jean-Paul Wiest who mapped out the project and wrote the entries for each digital photograph. Dr. Anthony Clark and Dr. Amanda Clark of Whitworth were in charge of the digitization, and Kathy Watts completed the upload of the final product onto Whitworth University Library’s Digital Commons webpage. Dr. Nailene Wiest served as an advisor to the project. Mr. Tibo Colman, Ms. Sarah Sprouse, students at Whitworth, assisted in the digitization process, the organization and correction of the digitized photographs, and the designing of the online interface. SAM holds the proprietary right of the content of the project. All inquiries regarding the digitized photographs should be sent to Dr. Jean-Paul Wiest, director of the project, and to Dr. Amanda Clark who supervises the webpage and the content therein.